Set in the far-away future of 2007, two cops/friends, Braniff (McQueen) and Sledge (Daniels) are some of the toughest police officers in L.A. Making their job much harder was the creation of areas known as “Zones of Personal Freedom” which later devolved into highly dangerous, lawless areas called “Hell Zones”. In order to break a counterfeit AIDS vaccine ring, Braniff and Sledge must go undercover into the Hell Zone. Ground zero for their investigation is an illegal Punchfighting ring run by the super-evil Drexal (Ruskin). They are fights to the death where competitors take on names and personas, and they are even given certain weapons at specific times, controlled by Ruskin and his lackeys. The unbeatable man-mountain known only as The Swordsman (Hellwig AKA The Ultimate Warrior!) not only is unstoppable in the Death Ring (as its called) but is also a destructive criminal in his own right. Will Braniff and Sledge survive enough death matches to take down Drexel and The Swordsman? Find out tonight! Chalk up yet another winner for PM. PM always seems to know just the right elements to keep action fans satisfied. And at least there are some ideas at work here, which is more than you can say for a lot of movies, action or otherwise. But it certainly doesn’t skimp in the action department, as there are car/motorcycle chases, gunfights, blow-ups, radically awesome lasers, exploding helicopters, loads of hand-to-hand combat and naturally the PM standby of “car flipping over in the middle of the street”. There are plenty of fun moments and the movie as a whole is never anything less than entertaining. We always love when movies are set in the future but is now the past. We try to collect those. You’d think the filmmakers, knowing full well their movie would exist on the video market, might last 15-20 years. But they make some surprisingly relevant comments about insurance rates and gas prices that are perhaps truer today than they were back when the movie was filmed. But that aside, The Ultimate Warrior is in this movie as the main baddie! His hair alone is worth seeing the movie for. Too bad this Swordsman wasn’t in the Lorenzo Lamas Swordsman (1992). ‘Warrior’s only spoken (or more accurately, roared) dialogue consists of him bellowing “Raaaaaahhhhhh!! !”, although, to be fair, at one point he diabolically laughs “heh heh heh”. Chad McQueen is still sleeveless and loving it as the main hero. But without Gary Daniels to brighten things up as his partner, the whole movie might have been a crashing dud. We think this is one of Gary’s most fun and upbeat roles. He truly adds life and energy to the proceedings. Whereas McQueen just seems to phone in his typical Chadditude. Don’t forget this was around the time of the dominance of American Gladiators, and clearly PM wanted in on some of that action. That would explain why characters are named Viper (played by Art Camacho), The Swordsman, Maniac, Dr. Death (the same Dr. Death from Ballistic, 1995?) and Sledge becomes “The Hammer” naturally, and McQueen becomes the fearsome “Alley Cat”. Plus Gerald Okamura is in an uncredited role as a fighter, and fan favorite Lawrence Hilton Jacobs does an awesome job as the ring announcer, even though he is unseen throughout the film. Also in the movie Braniff plays Super Nintendo with his son. Must be retro gaming. Not leaving any details out, there’s an end-credits song, “Hell Zone” by Adrienne Heath. While we’re not entirely sure why the movie is called Firepower, as it’s primarily about Punchfighting, we can definitely recommend it. Check it out. Also check out write-ups by our buddies: The Video Vacuum and DTVC! Yeah, this one wasn't too bad. It sometimes felt like a video game adaptation to a video game that never existed. Thanks for the plug and keep up the great work! Thanks. We have some fun stuff coming up for the rest of the December and 2013. 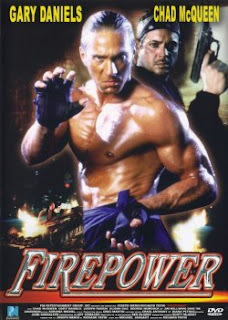 A Firepower video is a cool idea...Gary Daniels and Chad voicing their characters in a beat-em-up for the Sega Genesis. Yeah, this film seemed like a prime candidate for the Sega-CD, it's a shame Chad McQueen isn't acting anymore. Agreed...he should make more movies...maybe a comeback action movie with Billy Blanks! Yeah is a pretty good Daniels flick. Shame he wasn't the lead like the cover makes out. Chad is such a personality vacuum. Gary Daniels balances out Chad...that's why he is there. Go Sledge! Great review. A PM Entertainment movie is always a reliable choice. Thanks! This is one of their better ones. The Sweeper is one of the best PM flicks. Great review. I have to check this out. I am definitely a Gary Daniels fan and adding The Ultimate Warrior to that equation only sweetens the deal for me. We promise you will enjoy it! The Ultimate Warrior was great...same with Daniels.